As part of Mountain Equipment’s ongoing DOWN CODEX efforts, two staff members recently visited a UK farm which breeds both geese and ducks. Johnson and Swarbrick based near Preston are the world’s only producer of Goosnargh ducks, regarded as some of the finest in the country and used by many top chefs including Raymond Blanc and Gordon Ramsay. 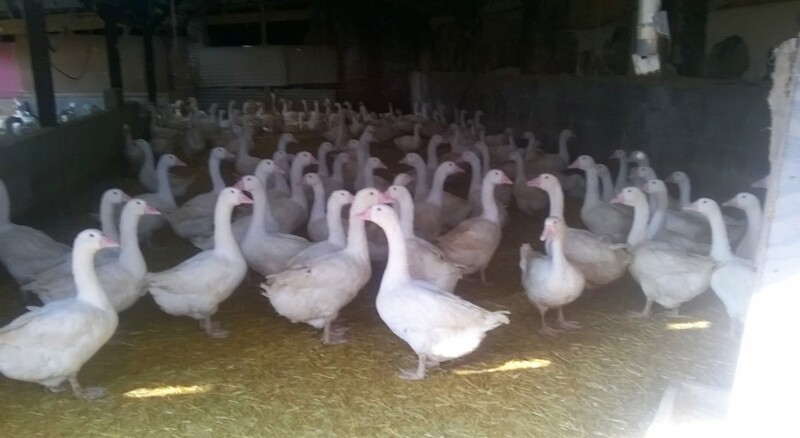 While Johnson and Swarbrick are not a supplier for Mountain Equipment, we were keen to learn more about the care and husbandry of geese and ducks from a farm that have won countless awards. Taking our DOWN CODEX auditing template as a reference, we discussed many aspects of care, housing, and husbandry of birds with the farm and looked at ducks from 5 days of age up to birds that had been slaughtered and were being plucked. The farm is fascinating in that it is almost an entirely-vertical operation: a nearby hatchery supplies birds that are a day old, and then everything from raising to meat and feather processing happens on-site. In the birds’ sheds, stocking densities are carefully checked and as the birds grow they are moved to larger housing. Our DOWN CODEX points regarding transportation of birds before slaughter are easily met as the slaughterhouse is only a few hundred metres from the birds’ sheds. The slaughterhouse operates three days a week with an accompanying vet present at all times, and the birds are hung before being plucked. While the carcasses are sent to restaurants, shops, and hotels, the down and feathers are kept on-site where they are washed in a huge cylindrical drum to remove any detritus and excess oils. They are then spin-dried, tumble-dried, and cooled before being stored at the farm. Our DOWN CODEX is not a rigid policy, but one that evolves and changes as we learn more and listen to valued opinions. There are some aspects of animal husbandry over which we will never budge – no live plucking, no down and feather coming from birds killed for foie gras production, etc. – but other parts of our guidelines are interesting to discuss with different experts, whether they are farms, vets, animal charities, or auditing bodies. This all helps our DOWN CODEX improve and maintain its position as the world’s most comprehensive down traceability project: being first isn’t good enough; we need to remain the best, and visits such as this all help inform our changes and improvements.